Accumulation/Distribution (A/D) is momentum indicator in technical analysis created by Marc Chaikin. It measures if investors are generally buying (accumulation) or selling (distribution) by measuring volume of price movement. C is closing price, H and L are highs and lows for period t.
When value of A/D goes up it means that financial instrument is accumulated. In case when value of A/D is falling it means that financial instrument is distributed. Buying and selling signals could be generated using divergence: if price of security is falling, but value of A/D is rising (positive divergence) we could expect that soon prices will start to grow. Similar applies to up trend (when price is rising and A/D is falling, soon trend will change). 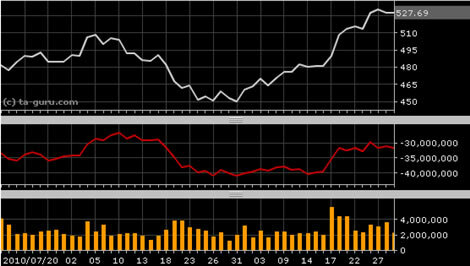 Open chart for google with A/D indicator.